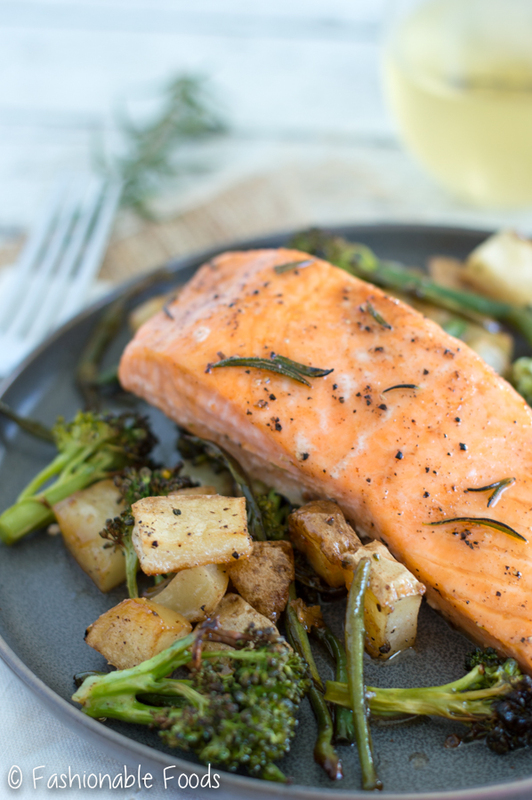 An easy, healthy make-ahead meal perfect for busy weeknights! 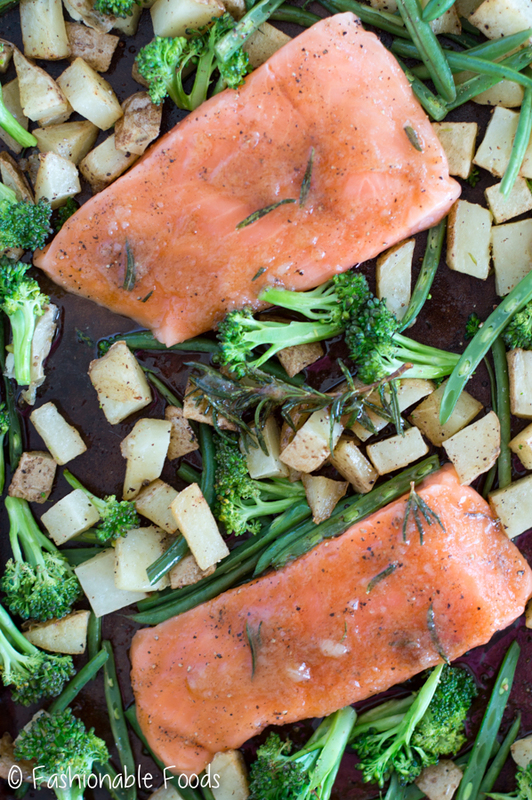 Maple brown butter sheet pan salmon and vegetables is simple, but insanely delicious. All the prep work is done ahead, so all you have to do is pop dinner in the oven, put your feet up, and wait for it to be done! Sheet pan dinners are all the rage these days. And for good reason! Who doesn’t want a meal they can throw together on a sheet pan and pop it in the oven? Not only do I have a tasty sheet pan meal for you, but it’s a make-ahead meal, too! 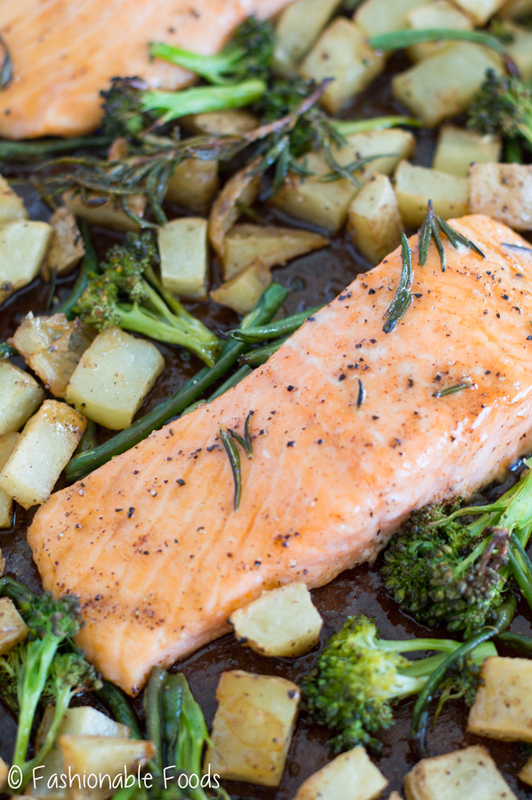 Recipe number two in my make-ahead meal series is maple brown butter sheet pan salmon and veggies. YES. We are going from the ultimate comfort food of best baked macaroni and cheese, to a lighter, healthier salmon dish. Just goes to show you can make comfort food ahead… and healthier stuff, too. Obviously you don’t have to use this as a make-ahead dish, but if you’re pressed for time during the week, it can be helpful to have a few of these recipes up your sleeve! When I worked outside of the home, make-ahead meals were everything. Especially on Mondays! I absolutely hated coming home on a Monday and cooking. So, on Sundays I always spent a little time making/prepping dinner for Monday night. That when, when I would get home from work I could just pop dinner the oven and plop myself on the couch. With some wine, of course. ? 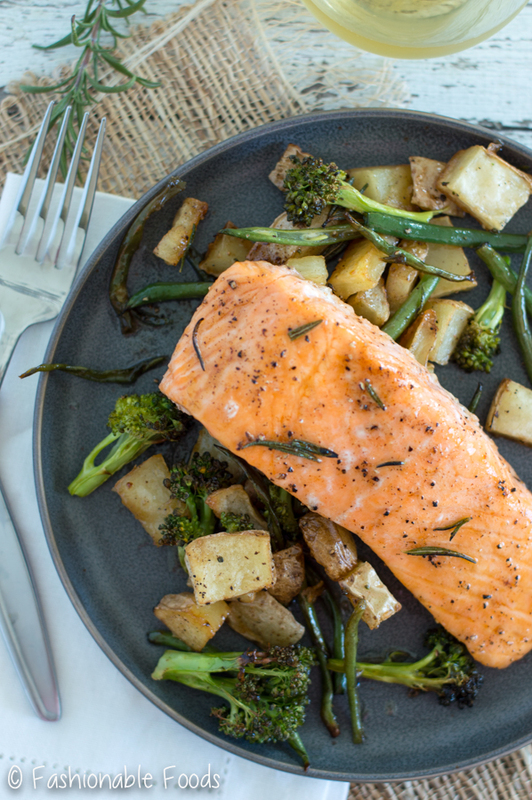 With about 30 minutes of prep time you can throw together a healthy meal for a busy night. 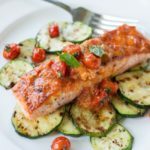 All you need are some veggies, salmon, and brown butter <– because I love adding a bit of an indulgence to a healthy meal. ? 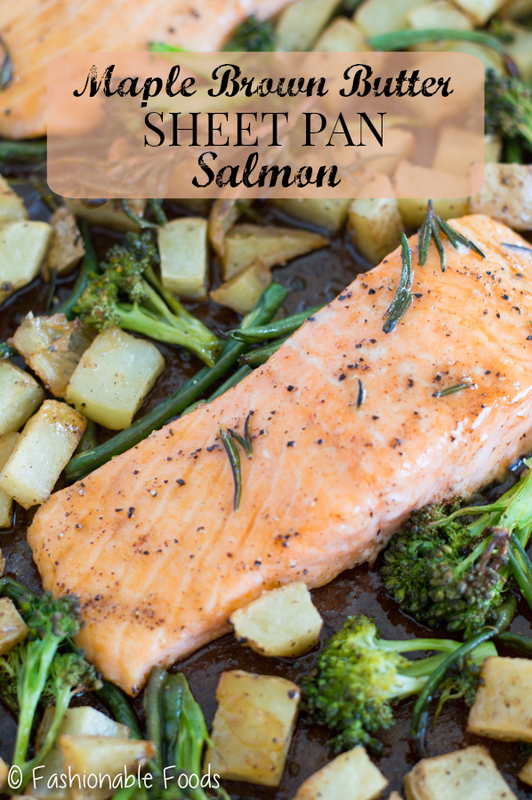 My initial plan for this sheet pan salmon and veggies included sweet potatoes and brussels sprouts. However, my sweet potato was rotten and my garden is full of broccoli. So, I grabbed some white potatoes (that I grew over the summer! ), the fresh-picked broccoli, and some green beans I had hanging out in my fridge. Consider this recipe more of a basic method that you can switch up as you please. Sweet potatoes or butternut squash would be super fantastic (and very fall-ish).. brussels sprouts, cauliflower, carrots, turnips, or parsnips would all be tasty, too! The prep work is really simple – cut up your potatoes and get them roasting while you brown the butter. I like to brown the butter with rosemary added since it pairs so well with the salmon, and then we add some maple syrup for sweetness. I can’t even describe how good that brown butter is, so just take my word for it! Once your potatoes are partially roasted (just beginning to brown on the edges) you’ll take ’em out, let them cool completely, and then add all the rest of the ingredients. Pop the sheet pan in the fridge (up to 24 hours ahead of time) and when you’re ready to eat, just pop it in the oven and bake! There is nothing better than coming home from a long day and being able to relax on the couch while dinner cooks in the oven. Nothing better. 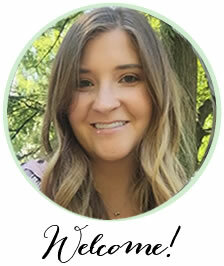 No messy kitchen and very minimal cleanup! You can also line your baking sheet with foil or parchment to really minimize the cleanup. Oh, and I hope you’re adjusting to the time change. I’m hating how early the sun goes down, but otherwise I’ve adjusted! I’m already counting down the days (123!) until we go back to Daylight Saving Time. ? An easy, healthy make-ahead meal perfect for busy weeknights! All the prep work is done ahead, so all you have to do is pop dinner in the oven, put your feet up, and wait for it to be done! Toss the potatoes on a baking sheet with the oil and season with salt and pepper. Roast the potatoes for 15-20 minutes, just until the edges begin to brown. While the potatoes are roasting, melt the butter with the rosemary in a small skillet over medium-low heat. Once it’s melted it will start bubbling and then begin to brown. As the bubbling subsides, you will see the butter turning light brown. Remove the skillet from the heat and stir in the maple syrup. Remove the rosemary sprig and set the butter aside to cool. Once your potatoes are done roasting, (they won’t be completely cooked as they will be going back in the oven later) remove the pan from the oven and let it cool completely. 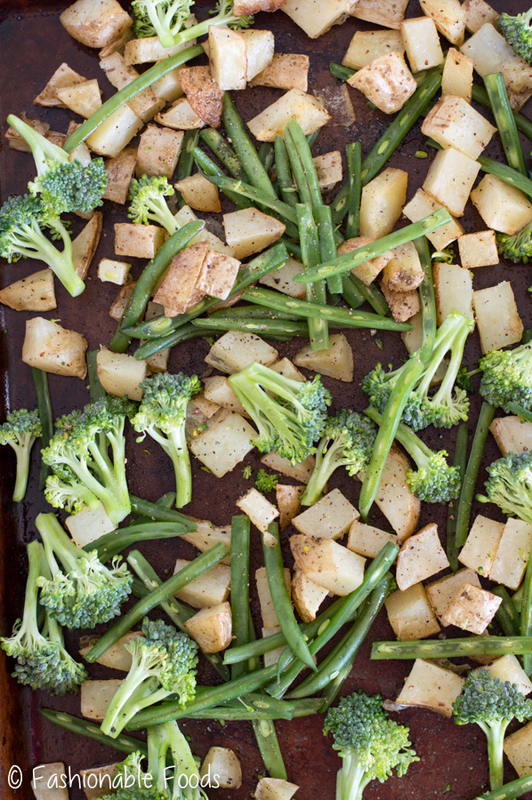 Toss the broccoli and green beans with the potatoes, adding additional oil if the veggies seem dry. Clear two spots for the salmon filets and lay them on the sheet pan. Top each filet evenly with the brown butter mixture and season with salt and pepper. Cover the food loosely with plastic and place the pan in the refrigerator. You can do this up to 1 day ahead. When you’re ready to make dinner, remove the baking sheet from the refrigerator while you preheat the oven to 425º. 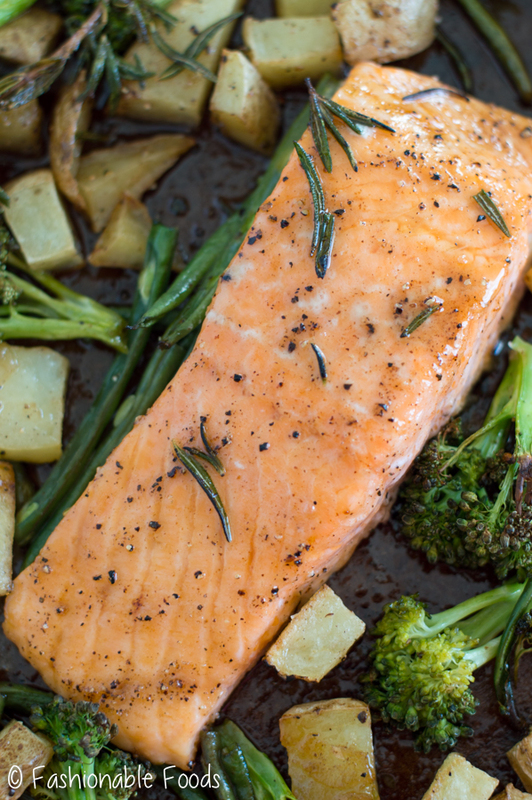 Roast the salmon and veggies for 12-15 minutes, or until the salmon is tender and flaky and the veggies around cooked to crisp-tender. 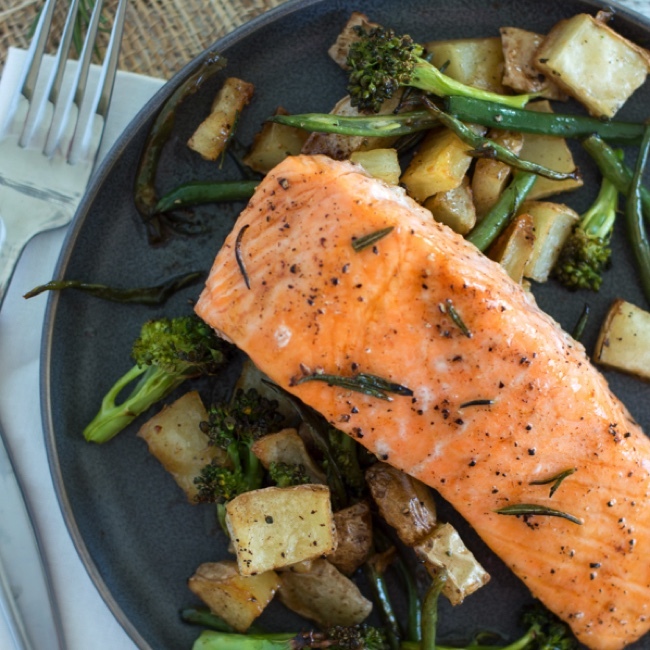 *If you don’t want this as a make-ahead meal, simply follow the recipe, but instead of cooling the potatoes just add the broccoli, green beans, and salmon to the hot pan and then proceed with the roasting time. *Use your favorite veggies – sweet potatoes, butternut squash, acorn squash, brussels sprouts, cauliflower, etc. Anything that you like roasted will work here; just keep in mind the cook time! 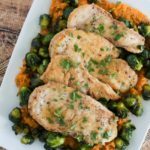 For example, sweet potatoes will need less time than the Yukon gold potatoes and if you use brussels sprouts, add them with the potatoes to roast since they will require more time. *This recipe serves 2, but it can easily be increased. You will need a second baking sheet or a half sheet pan to make 4-6 servings. 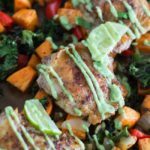 Sheet pan meals are definitely my jam, especially during the week! And I happen to LOVE me some salmon! Needless to say, this sheet pan is SCREAMING my name! 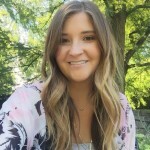 I just love that maple and brown butter combo, girlie! This looks absolutely FABULOUS! Cheers!